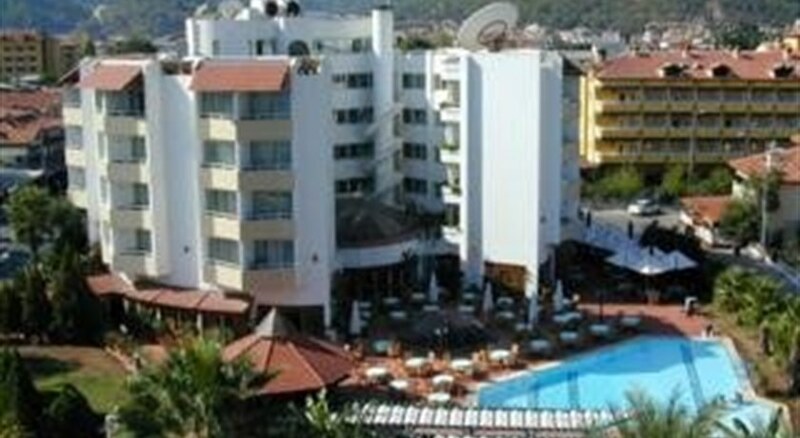 Verde Hotel is a 4 star hotel and located in the popular and attractive area of Icmeler, Turkey. It is a moment's walk from the nearest golden beach and within easy reach of the region's amenities and attractions, including the famous Canal, a much-loved area filled with market stalls and inviting restaurants. The hotel facilities provide well to all holiday makers and include swimming pool, fitness and a restaurant, to cover all your needs. The hotel offers excellent and good-sized guestrooms with modern designed and comfortable accommodation feature such as air conditioning, private bathroom with shower, cable TV, telephone, mini bar, desk, hair dryer, safe and balcony. (Certain amenities may be payable locally). From the Airport to Dalaman is 105 km away. The Verde Hotel is home to an indoor and outdoor restaurant that serves local Turkish dishes as well as international cuisine. Guests can eat indoors or outdoors depending on the weather, while a children's menu is also available. The restaurant is open for breakfast, lunch and dinner. Guests can enjoy a wide variety of drinks and snacks at the hotel's pool bar. 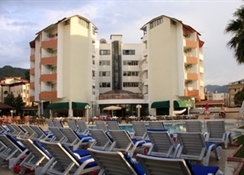 The Verde Hotel offers its guests a range of leisure facilities and easy access to the local beach, which provides water sport and relaxation opportunities. Within the hotel guests will find an outdoor swimming pool, landscaped gardens, a spa and wellness center with sauna and Turkish Baths and massage facilities. Diving equipment can be rented from the hotel and used at various points in the nearby sea. A games room and play area are available for children. Other services The Verde Hotel's front desk is open 24 hours a day and provides a number of services including room service, luggage storage, dry cleaning and currency exchange. 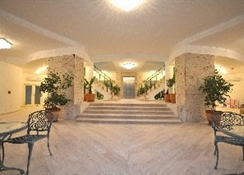 The hotel comprises of 80 rooms, each featuring a private bathroom, hair-dryer, telephone, satellite TV, mini-bar, safety box rental, air-conditioning and balcony (some local charges may apply). Special Information: Please note: rates displayed are not available for Turkish Nationals. Please Note: Stamp on arrival visa's are being replaced by the new e-visa application process. All visitors to Turkey from 10th April 2014 will be required to purchase their entry visa via the Turkish Government website www.evisa.gov.tr prior to travel. * Local charges may apply to some hotel facilities and others may be seasonal. All Inclusive: The All Inclusive information is a guide only and is subject to change and/or availability. All inclusive includes all meals served buffet style in the main restaurant, breakfast 07:30- 10:00, lunch 12:30- 14:00 and dinner 19:30- 21:30. Snacks are available 14:30-16:00 (hamburger & chips) and coffee break is 16:30-17:00. All soft drinks and local alcoholic drinks are available between 10:00- 24:00. * The All Inclusive food and drink information is a guide only and may be subject to change and/or availability and may vary between hotels. Situated a short walk from the center of Gumbet, the Verde Hotel places guests within walking distance of all the area's most popular bars, shops and restaurants. The beach can be reached on foot, with guests of the hotel provided with panoramic views of the Mediterranean from their guestroom balconies. Accommodation The hotel offers 100 rooms, all of which offer flat-screen TV, a minibar, and an en suite bathroom with shower and hairdryer. All rooms feature a modern, bright design and come with balconies that overlook the surrounding area.